It's the smallest and most densely populated country in Central America. Known as the "Land of Volcanoes", it has frequent earthquakes and volcanic activity. It's the only country in Central America without Caribbean coast line access. The country had a terrible civil war from 1979 to 1992. Over 80,000 people were killed during the war. The national dish is the famous pupusa (which dates from pre-Columbian times). Only close friends may hug and kiss on the right cheek as a sign of respect in greeting others. 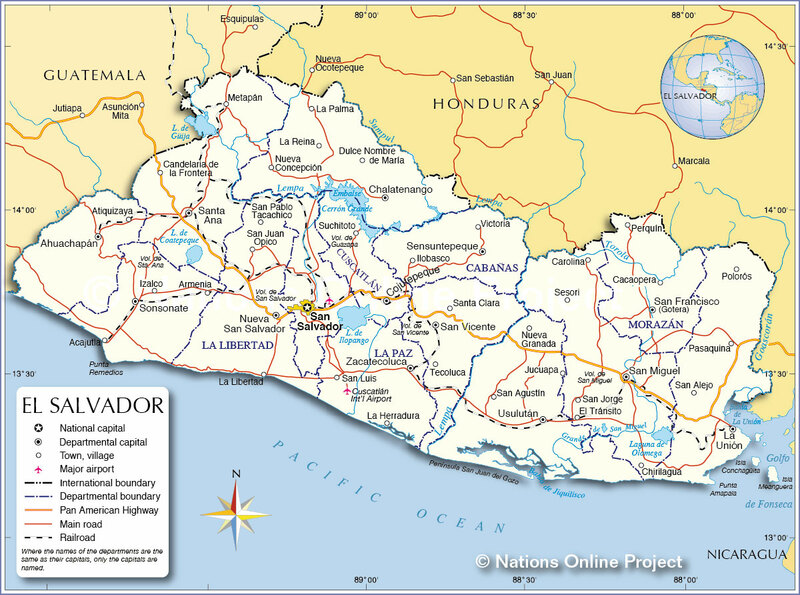 El Salvador is slightly smaller than the US state of Massachusetts. Try the Pupusas which are traditional Salvadoran dish. It's made of a thick, handmade corn tortilla with a consistency close to a tamale, that is usually filled with a blend of cheese, cooked pork ground to a paste consistency, and refried beans. They are then cooked in a wood fired oven and are absolutely delicious and cheap! Visit El Tunco and learn to surf and hang out at in the laid back village. El Tunco boasts some of the best surf in Central America and the world. Visit Los Chorros. It's an emerald green pool that is fed by what appears to be a huge wall of little waterfalls.